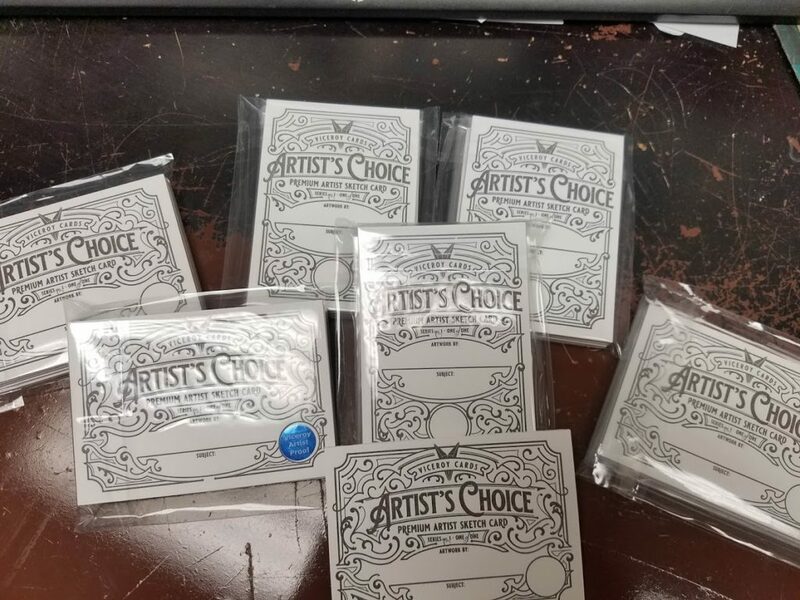 New Sketch Card series I’m on from Viceroy Cards…ARTIST CHOICE! 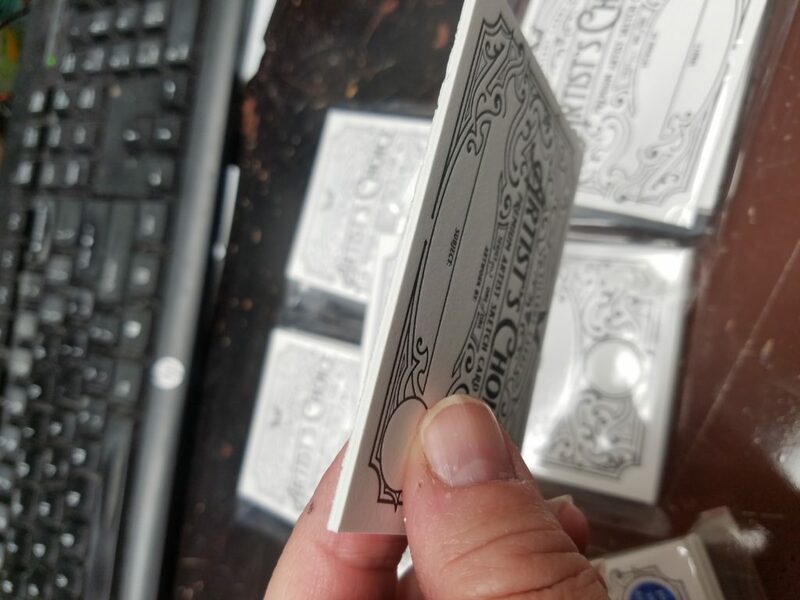 My next sketch card project is here!! This series is again with terrific Viceroy Cards (my 2nd with them–the first series being the Space 2 card set). These cards are phenomenal! Ultra awesome and high quality! These cards are like thick illustration board and a pleasure to draw and paint on! I can’t wait to get started! When I paint I’m rarely delicate–and these cards know how to take a tickle! The theme of this series is Artists Choice–which sounds easy and just ripe with potential, right? It’s also kinda scary and intimidating–What will I draw? Do I want to go 3D? Do I want a theme or just do whatever strikes my fancy at the time? Kinda got my idea–many, many moons ago (early 2000’s) Barry and I did some of the first online webcomics–before webcomic became such a thing–called Abby’s Menagerie. AM was about a girl who worked at a zoo where extinct animals just appeared. Barry’s online webcomic was The Damnation Gambit–dark, gritty…pure awesomeness. There’s hardly a day where I don’t think about Abby’s Menagerie. It meant that much. And ya know what? Hardly a single thing remains of either AM or DG! I’ve got [most of] the original art, but all the original animated panels and colored panels–totally gone. We never worked at high rez back in those days because we never thought we’d go to print and the size we were working at or with the expense of printing (we thought) would make it impossible to produce. The hard drive that had all the art and story –gone. There’s a lesson for every creator here–save to the cloud!! and make multiple, multiple backups. We had a lot of great people say a lot of really good things about Abby’s Menagerie. So part of me is thinking about doing an extinct animals theme on this set–something close to my heart. It’s funny, I have almost ALL the Artist Proofs from every card set I’ve ever contributed to. I never know what to do with them lol. So they all just site in a cubby on my drafting table. Viceroy Cards is awesome because they encourage artists to post their work in progress (THANK YOU!!!) So I’ll post art updates as I go along! I’m excited to be involved with this set. Lots of amazing fellow artists that I can’t wait to see what they do and I hope you are excited too! And ya know what? Hardly a single iota remains of either AM or DG! I’ve got [most of] the original art, but all the original animated panels and colored panels–totally gone.